Handmade PurrPrints (on etsy): Here you can find signed prints and art cards (ACEOs), necklaces, magnets, cards and a few other goodies. Everything is designed, made, and mailed by me directly to you. PurrPrints Large Prints and more on zazzle: Here are a variety of unusual goodies I can't make by hand, like ties, calendars and postage stamps--and, most importantly, larger archival prints than what I can offer in my etsy shop. Though these are unsigned, customers who are willing to pay shipping can send them to me to be signed after they receive them if they wish. PurrPrints Apparel and more on Cafepress: Here you can find apparel and housewares with the most popular PurrPrints designs--these are all the items I haven't yet learned to make by hand. Each cafepress shop is organized by design, and I try to add new shops as new designs become popular. Any of the items you see on cafepress can be made with any of my designs and I'm happy to fulfill requests for a particular combination. Just use my contact form to let me know what you'd like. 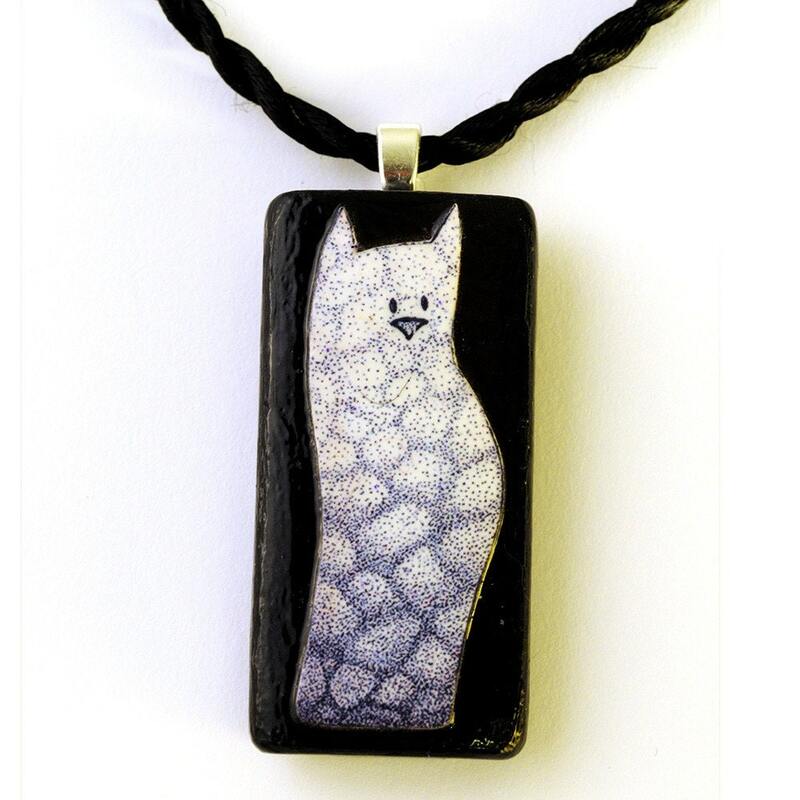 The best way to keep track of any new developments in PurrPrints designs, sales, or giveaways is through the blog and newsletter (which you can subscribe to with the form in the upper left corner). The newsletter comes out just once a month and offers an exclusive contest to subscribers with a chance to win a $20 gift certificate to PurrPrints on etsy. The blog regularly hosts giveaways as well, along with posting reviews of other items on etsy, information on new designs, cute cat pictures, and anything else that catches my eye. Now that you know all the business info, let me tell you a bit about who the artist is behind PurrPrints. My name's Rebecca (though everyone calls me Becca), and I've lived with cats all my life (well, except for that first year in college where we could only have pets in aquariums and I got a snake. Once I realized that snakes do not: play with catnip, curl up next to your pillow at night, purr, or greet you when you come home, I gave the snake to a friend, moved off campus, and resumed living with cats). In fact, there are these adorable pictures of me as a little baby with the family cat following me around and...well, anyway, I don't want to bore you. I've also been involved in art for as long as I can remember. My grandmother was a talented painter and she would bring me over for art play dates when I was young. Though in my later art education I became more interested in pen and ink work than painting, I'll always credit her with my appreciation for art. The collision between art and cats was an inevitable one, but I didn't begin offering my work for sale until 2006 when a friend saw my notebooks full of cat drawings and encouraged me to pursue selling my work. Since joining the community of artists and crafters on etsy in may of 2008 my interests and abilities have broadened, allowing my to offer handmade necklaces, cards, magnets, and (soon) custom cat tags and charms. It's been an exciting journey so far, and I'm looking forward to what comes next. But enough with all my earnest aww-shucks-ness; you'll quickly discover if you spend much time on my blog that I'm as irreverent and sarcastically self-aggrandizing as they come so all this direct sincerity is starting to make me feel funny. Thanks for coming by--I welcome your ideas, comments, suggestions, and random thoughts. You can contact me any time and I'll get back with you as soon as I'm able. Nothinglikeit - Because most things are funnier when you flatten them! Like cats, or know someone who does?